Two early dairies in Lafayette that delivered milk door-to-door were the Kneebone Dairy and the Home Dairy. Kneebones delivered raw milk while Home Dairy delivered pasteurized milk. 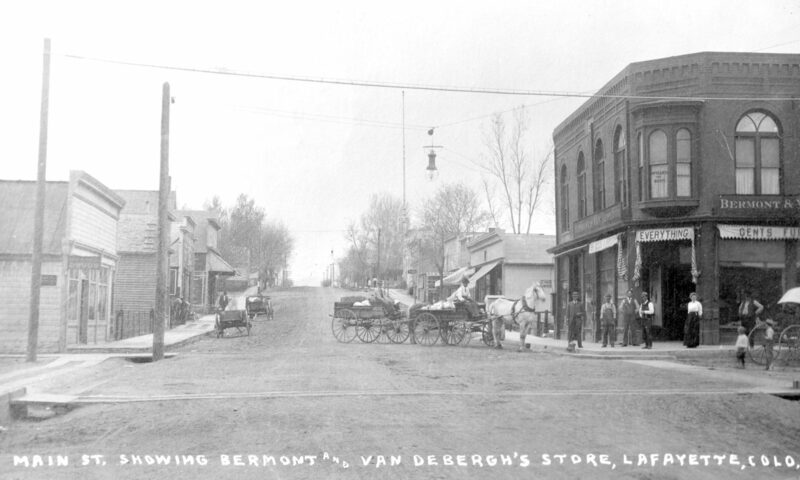 The Kneebone Farm was at the corner of 111th Ave. and Arapahoe Road, but the Kneebone Family maintained their dairy herd of 40 to 60 head in the fields along the north side of E. Elm Street in Lafayette. Home Dairy bought milk from area dairy farmers. 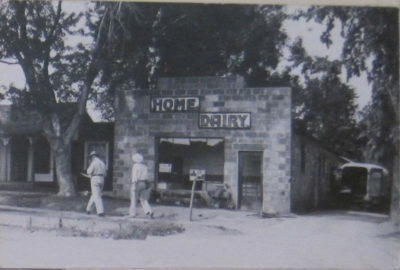 Home Dairy at 409 E. Oak in Lafayette, about 1948. Photo courtesy Lafayette Historic Preservation Board. In 1937, John R. “Jack” Lewis, Sr. (1910-1989) and his brother, George “Nip” Lewis (1911-2005), started the Home Dairy after purchasing the Monarch Steam Laundry at 411 E. Oak Street in Lafayette. Lewises installed a creamery, complete with pasteurization equipment, next door at 409 E. Oak Street. They also built an ice house across the street. Jack Lewis and Nip Lewis were the sons of Mary Hannah (Kneebone) Lewis (1885-1963), and John B. Lewis (1879-1952). John W. Kneebone (1921-2003) said in a 1986 Boulder Public Library Maria Rogers Oral History interview that his family bottled and delivered milk from 1930 to 1947. The route included Lafayette and Erie homes and area coal mines, including the Columbine and Boulder Valley mine camps. Since there was no way to refrigerate the milk, the milk delivery day started at 4 a.m. and was completed by 8 a.m. In summer, potato sacks were soaked in water and packed around the milk cans for cooling. John’s younger brother, Clarence Kneebone, told me in 2017 that he and his siblings were charged with milking the cows, cleaning the milk bottles for refilling, and also helped deliver the milk each day to several hundred customers. Clarence would ride the sideboard of the delivery truck up and down Lafayette streets. He’d hop off the truck and swap empty bottles for fresh milk. Colorado was one of the last states to require all milk to be pasteurized, which happened in the mid-1940s at the behest of Florence Sabin, a retired professor of medicine. Pasteurization is a process of heating milk to kill microorganisms, then cooling it for bottling and delivery. The pasteurization provision forced the Kneebones to stop bottling and delivering milk in 1947, after which time they sold milk to Meadow Gold, Watts-Hardy and Home dairies. The Home Dairy closed about 1960. The original house for the Kneebone Farm, built in 1900, was moved to its current location at 307 E. Oak Street in Lafayette in the 1940s.